A total of 135 Senior High Schools have qualified for the 2017 edition of the National Science & Maths Quiz scheduled for June this year. This year’s edition will be the 22nd since Primetime started the production in 1993. Out of the 135 schools, 108 qualified through the Regional Competitions held across the country in January-February 2017. 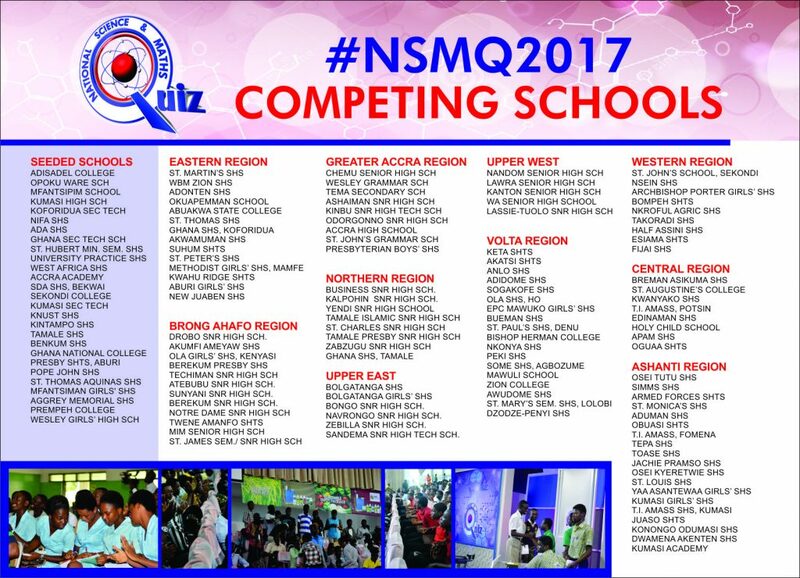 The other 27 are seeded schools that made it to at least, the quarter final stage of the 2016 edition of the competition. This year is our year. Go go go high, go Kumasi Secondary Technical School (K.S.T.S) The sky is your limit. st thomas aquinas all the way up.nothing can stop us. (BEEBE)no time to waste. We are back again. Our stars have risen. This is our year of Glory, This is our time. GO HIGH AHENEMMA!!! GO HIGH OKESS !!! GO HIGH OSEI KYERETWIE SENIOR HIGH SCHOOL!!! MOORREEE VIMMM!!! lifting the name of St. Hubert sem shs on high. We know it has been inscribed in every corner of the country that this is our year of triumph.